Olark is one of the most popular Live Chat Solutions available in today’s market with customer base of more than 10,000. Olark provides standard & premium fetaures covering all the different aspects of customer chat. Today AzureDesk is happy to announce the integration of Olark to AzureDesk. Olark Integration will now be available in Apps in AzureDesk. 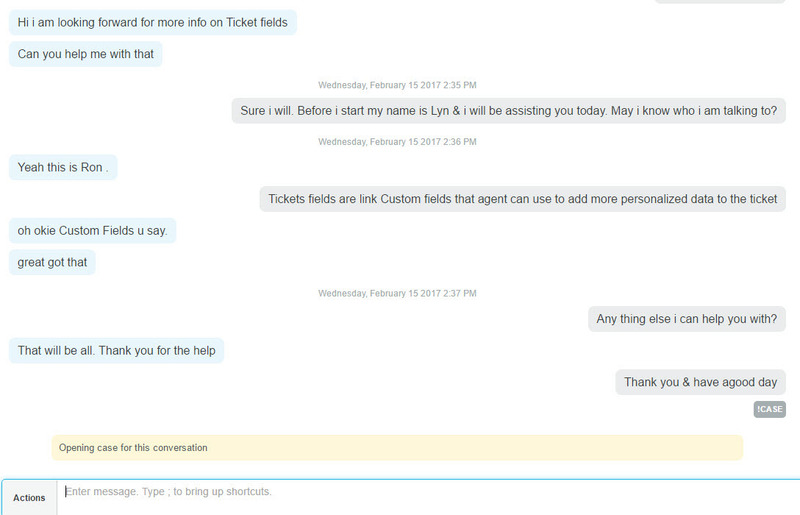 All the conversations that takes place using Olark chat can be converted into the Ticket with a unique ticket id# in AzureDesk. Once the chat is completed & agent decides to convert this chat conversation into the ticket for further assistance than all agent have to do is type in “!CASE” & entire conversation is saved in the form of a ticket with a ticket id. After ticket is created agent can use AzureDesk ticketing system to help your customers. By doing this you can track all your customers & there is no way of missing out on any customer. Most important Agent can differentiate between who can be a prospect customer & which customer needs more follow up. All these leads can be triaged & answered accordingly. By using AzureDesk & Olark you can be rest assured that none of your customers are left unanswered. Using Olark & AzureDesk integrations agents can be more productive in helping customers resolve their issues. In order to set up Olark Integration refer the Link . Once the integration is done than your customer service agent is all set to provide what is called as Good Customer Service. We are excited to partner with Olark to help you stay connected with your customers all the time. If you are still looking for help desk software than your search ends here. AzureDesk provides a free 14 day trial before you make any decision.